Thailand's army declared martial law in a surprise announcement before dawn Tuesday that it said was aimed at keeping the country stable after six months of sometimes violent political unrest. The military, however, denied a coup d'etat was underway. The move effectively places the army in charge of public security nationwide. It comes one day after the Southeast Asian country's caretaker prime minister refused to step down and follows six months of anti-government demonstrations that have failed to oust the government. On a major road in front of Central World, one of the country's most luxurious shopping malls, bystanders gawked at soldiers in jeeps mounted with machine-guns who diverted traffic. The mood wasn't tense; passers-by stopped to take cell phone pictures of the soldiers. An army official, speaking on condition of anonymity because of the sensitivity of the situation, told The Associated Press "this is definitely not a coup. This is only to provide safety to the people and the people can still carry on their lives as normal." "Security matters will be handled solely by the military, and whether the situation intensifies or is resolved is up to them," he said. "There is no cause to panic. Personally, I welcome the move." 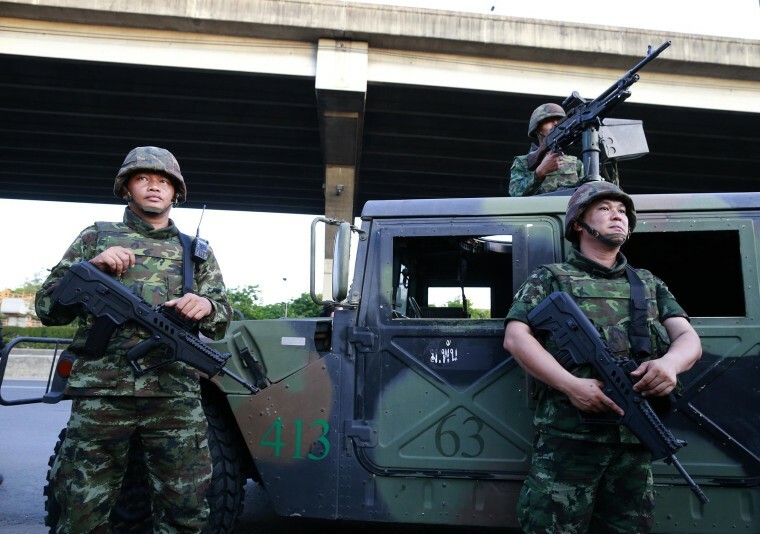 Thailand's army has staged at 11 successful coups since the end of absolute monarchy in 1932. The last was in 2006. On Monday, Thailand's acting prime minister insisted his government will not resign, resisting pressure from a group of senators who are seeking ways to settle the country's political crisis, and from anti-government protesters who are demanding an appointed prime minister. The deadlock in Southeast Asia's second-largest economy has worsened since former Prime Minister Yingluck Shinawatra dissolved the lower house in December in a bid to ease the crisis. The Constitutional Court ousted her and nine Cabinet ministers earlier this month for abuse of power.